In 1990 South Africa’s President Frederik Willem de Klerk decided to release Nelson Mandela, leader of the liberation movement, who had been in prison since 1963. Following the release, the two politicians worked together to bring an end to the policy of racial segregation and the formerly banned African National Congress was legalized… It was for this participation in this peace process that both de Klerk and Mandela were jointly awarded the Nobel Peace Prize in 1993. 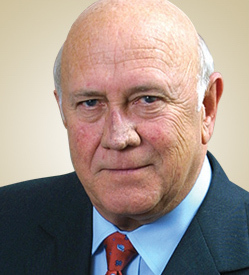 When de Klerk took office as President in 1989, no one expected him to play a key part in the termination of apartheid. Both as a lawyer, as a parliamentarian, and as a member of the government he had stood out as a firm upholder of white privilege. But when he realized that the apartheid system was leading to both economic and political bankruptcy, he put himself at the head of a radical change of course. He continued the negotiations with Mandela and the ANC liberation movement, which had begun in secret. They agreed to prepare for a presidential election and to draw up a new constitution with equal voting rights for every population group in the country. He will share stories of his unlikely partnership with Nelson Mandela, how this union brought an end to apartheid and his hopes for the future.